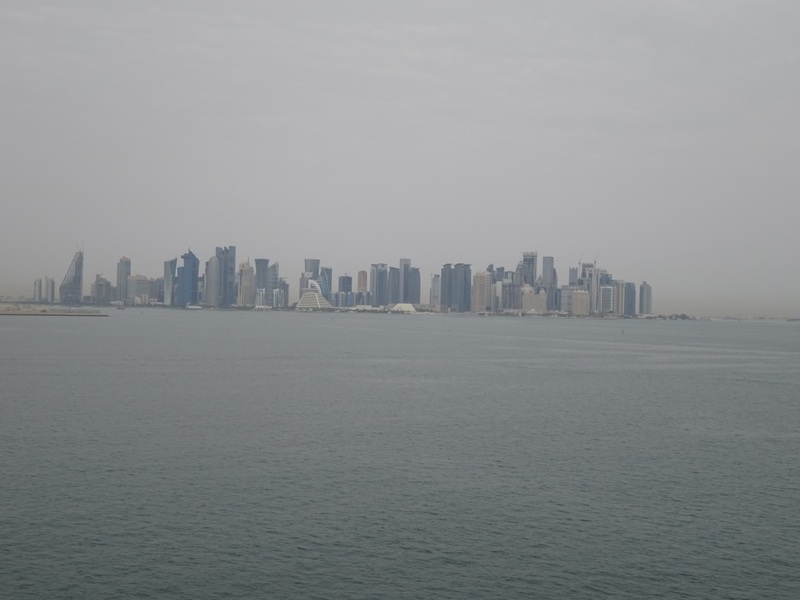 09 April 2019; Doha, Qatar. The whole coast in this area is very shallow and thus there are dredged channels and long meandering buoy routes to get you to the ports. Most of them are oil ports but then there is an occasional city as well. Qatar is no different; a very long approach through buoyed channels (with hopefully most of the time with the buoys in the right location) and then coming to a port that is under construction and a VERY LONG way from the new city. Easily visible on the horizon as one spiky mountain of glass and concrete but a long distance from where we are docked. There is not even a cruise terminal yet, just a large Marque but it is all part of a great plan. In 2022 the world championships Football (soccer for the Americans) will be played here and the plan is to build a complete Olympic center with a cruise terminal. 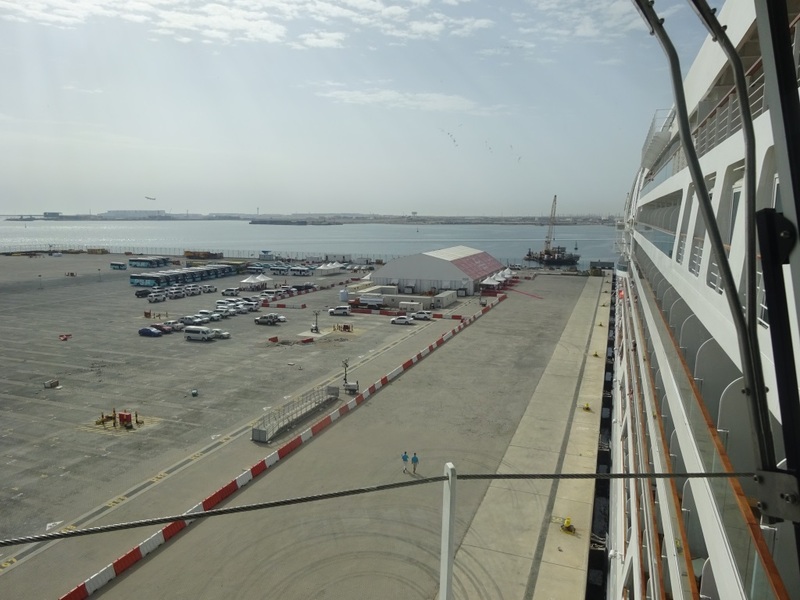 Whether they plan to use the cruise terminal for chartered cruise ships for extra Hotel accommodation, or just for cruise calls, is something I do not know. Just that they have to get a move on, if they want to be finished on time. At the moment, and it is maybe a small detail, there is not a football stadium in sight yet. Thus the guests had to go a long way to get to where they wanted to be. We were lucky again as it was not that warm as the skies were mainly overcast. Qatar (pronounced Ku-Ter, or Ka-TAR, or Ka-tr or Catarh) is a very small state but it has a lot of oil and gas. So much oil that a liter of water costs more than a liter of petrol. The ship stayed here from 08.00 hrs. until 18.00 hrs. Because of the loop we are making to the West from Dubai, we went one hour back last night, and tonight we will go one hour forward again as we will sail east towards Muscat. That port is further to the south as well and thus we will have a day at sea to get out of the Persian Gulf. That will be the start of an interesting time as we will be sailing through areas where the neighbors do not agree with each other. During the daily planning for the next leg of the voyage we get an update from the Security Officer of what might be going on in a certain area. Fishermen fight with fishermen (over the daily catch) so do not be amazed if you see a fisherman with a gun. That is not meant for us, it is just to show that he has one, so his neighbor fisherman will not get the idea of pulling a fast one. The long approach to Doha. Everything that is blue is less than 10 meters and the dark parts are not much more. 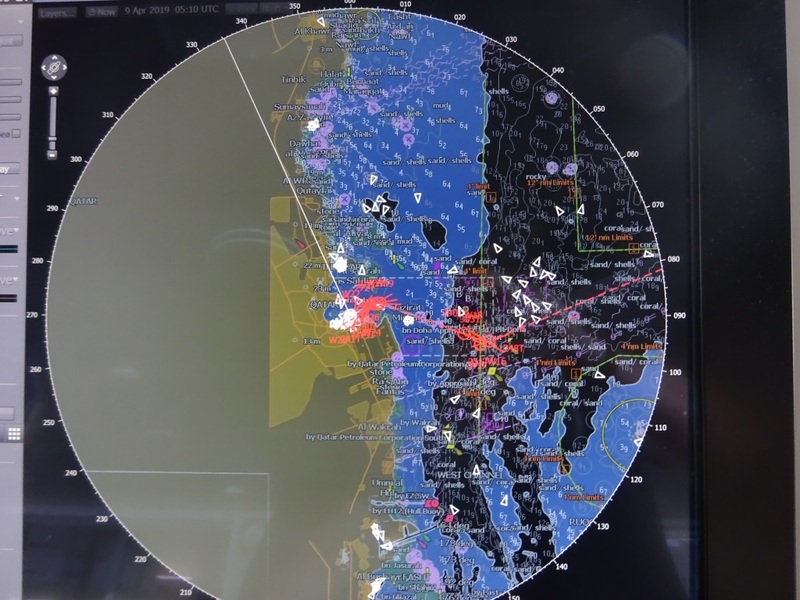 Thus we see also patrol boats from various nations who do not agree with each other, but the hostilities seem to be more on a political level than on patrol boat level. The bridge gets frequent calls for I.D and other information but then always a thank you and a “safe voyage”. After Muscat we will come to the Pirate Waters which were very much in the news some years ago. Things have quieted down here considerably since then as well, mainly due to NATO who has an extensive fleet presence here and a few years ago adopted the policy of shoot and then ask. And that seems to work quite well. The ship will still take some safety measures but the risk of trans versing is nowadays considered very low and cruise ships have a high freeboard so stepping on board is not as easy as it is with a laden tanker or a cargo ship. The cruise pier. This was the only part where there was something. The rest is still completely bare. A lot of work to do before the supports can arrive and go to the games. So while the guests were busy with enjoying the delights of Doha (Dune Riding, Visiting the old city UNESCO listed, going on a Dhow and swim, or a 4 hour city tour) the crew was drilling. Much to the disgust of the lifesaving officer we were not allowed to lower boats in the water. We all thought that that was a real missed opportunity as the port – under construction – was empty and thus we were bothering nobody. The only thing I could do was offer them one of my fire drill specials but even I was slightly hampered as the Seabourn Ovation is much smaller than the HAL ships (Prinsendam excepted) and thus everything happens on a much smaller scale. Still a fire is a fire and there is always some sort of option to make things complicated so that we create some learning moments. So tomorrow we will be at sea and it promises to be a windy day. And wind normally brings desert sand with it and that means that all around us the horizon will be a sort of vaguely light brown. 10 April 2019; At Sea. Many thanks for your excellent posts. An old man, now, but I love reading about your days and your vivid descriptions of so many wonderful, far off places I’ll never see. Thank you, Sir! We will take our first River Cruise (Budapest-Amsterdam) in Sept. Our planned last will be the Voyage of the Vikings in July 2020. Any tips?